With all eyes either gazing in adoration or glazing over in rage at the waterfront plan, a small, community-spurred plan to bring about changes in a struggling, but hopeful neighborhood has finally come to fruition. 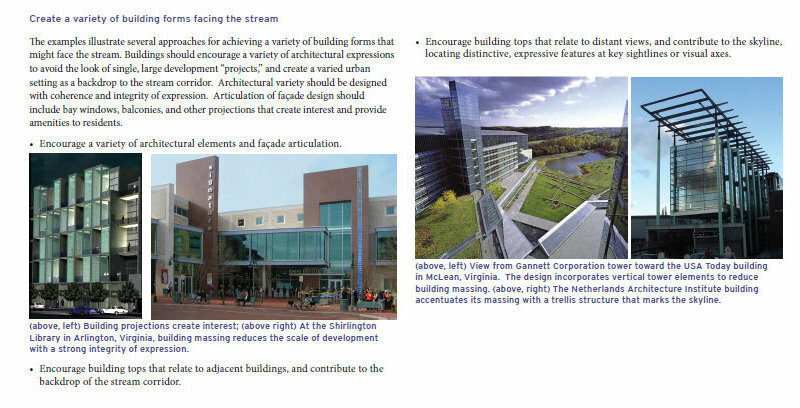 The Vision from the 1998 Plan. The Arlandria community has been planning for change longer than any other neighborhood in Alexandria. We are now a decade into implementation of the Arlandria Revitalization Plan, the result of the City and community-supported 5-year planning effort from 1998 to 2003. 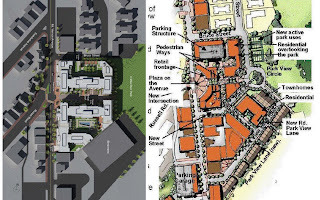 Broadly stated, the goal of the Plan was to build on the strength of Arlandria as a pedestrian-oriented, mixed-use place through the redevelopment of underutilized sites. Re-development of the "oppurtunity sites" was the anticipated catalyst for the proposed revitalization. Absent that outside investment, the City pursued modest improvements, but the opportunity to make a significant impact in a densely poor community was limited. Resources were put into an interim marketing strategy to strengthen existing businesses and community members worked to establish facade improvement guidelines for individual storefronts. But the efforts proved to be futile since many shopowners were barely breaking even. In the decade since the plan, shops were closing and turning over at an increasingly alarming rate. The shopowners that remained were barely holding on. A 2008 follow-up feasibility study, publicly unveiled 3 years ago, ultimately confirmed that conditions in Arlandria made development unfeasible. Paraphrased, "Arlandria was not worth the investment." The study pointed to an on-going perception of crime, a poor built environment, and lack of economic diversity as the three major impediments to economic development. The City attributed the stagnant plan implementation to a lack of community involvement. That comment and the implication of the feasibility study became the catalyst for the community led, city-supported grassroots efforts that followed. Within the parameters of maintaining the ethnic and economic diversity that define Arlandria, achieving sustainability became the overarching goal. Without outside investment, a group of volunteers took on the challenge of what remains a higher standard of fostering a supportive environment. Working hand-in-hand with neighbors and social service providers, community residents created a small business incubator in the farmers and artisans market. 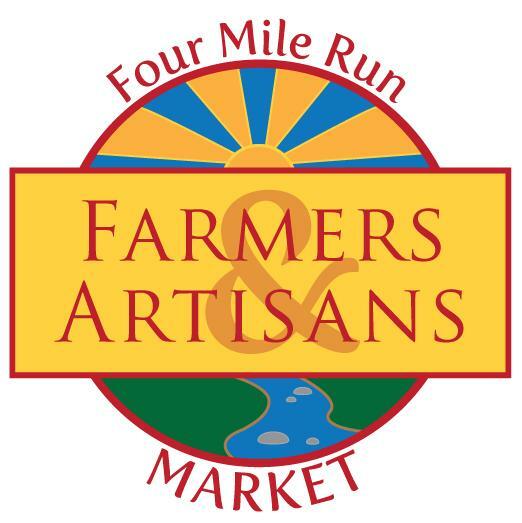 The Four Mile Run Farmers and Artisans Market is the sole market - in both Alexandria and Northern Virginia - to welcome SNAP (food stamps), a labor of love which took market organizers countless extra hours to establish and staff weekly. And the community has banded together to improve streetscapes and parks and maintained a presence at service provider and quality of life meetings to ensure every resident and visitor feels safe in our community. Along with the City, the neighborhood paved the way by working with our Community Oriented Police (COPS), ARHA, Community Lodgings, Wesley Housing, the Community Services Board, the Chirilagua Coop and most recently Arlington Housing Corporation to preserve existing housing and conditions for the city's most vulnerable citizens, and have strongly supported the inclusion of workforce housing to create upward mobility for hard-working residents - who would otherwise have to leave the City to improve their circumstance. According to Census, Arlandria's population is still highly transient (30% turnover per year, 90% every 5 years). The city and grassroots organizations have aimed to create an environment that allows more residents to make Alexandria into a long-term home by providing a wide range of housing. That solution requires something more than very low rent and very high cost properties. Economic diversity and livability are key to a sustainable community. The long-awaited plan to re-develop the Arlandria Shopping Center (Mount Vernon Village Center) overcomes the challenges presented in the feasibility study from 3 years ago. After years of painstaking, frustrating and sometimes seemingly futile efforts, one of our community partners has proposed the first step towards fulfillment of a decade-old promise to realize Arlandria as the proud waterside gateway into our wonderful city. In a constrained-resource environment, Arlandria Center, LLC has created a design that addresses the key issues in our neighborhood. It leads the way by making a positive change to the built environment and addresses the perception of crime by adding eyes on the street - where increased vitality becomes a deterrent to crime. 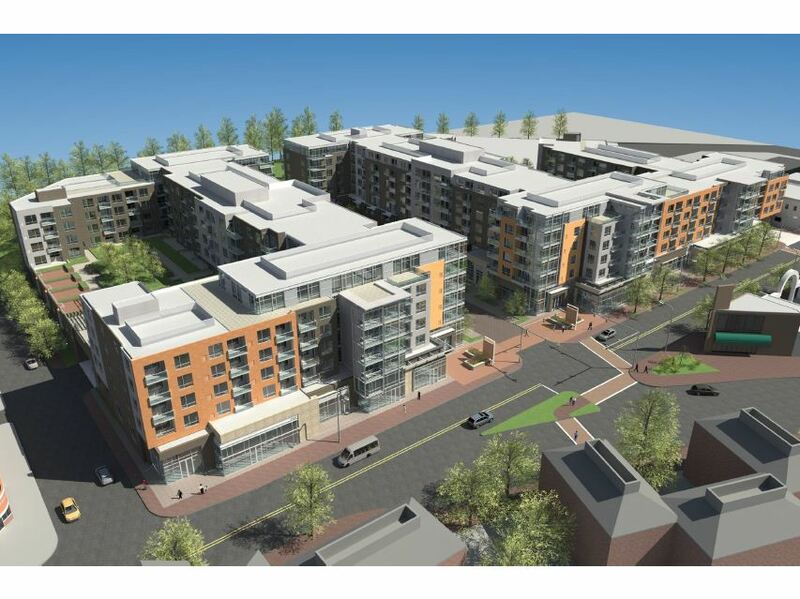 This current development application addresses many of the design goals of the Arlandria plan, proposing a mixed used property consisting of two multi-family residential buildings that maintain the 50,000 sq. ft. of retail along Mt Vernon Avenue (maintaining approximately the same amount of retail). Parking would be underground or buried within the building at grade. The plan includes streetscape improvements to Mt Vernon Avenue and Bruce Street, which include street trees, new bus shelters, and sidewalk widening. The high quality, contemporary design is in compliance with new green building standards and incorporates new affordable housing units for households earning less than 60% of the Area Median Income. The property also improves access to and increases visibility of Four Mile Run Park. The Mt. Vernon Village Center proposal for 450+ housing units is a first step on a long road to alleviate an impending housing crunch. The median age of housing stock within one mile of the project is 55 years old; within 5 miles: 44 years old. 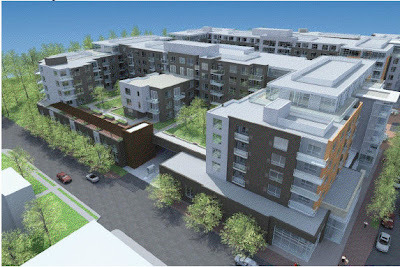 The development would also provide the city-code required 940 underground parking spaces. The project remains open to utilizing some parking spaces for other subsequent developments if the opportunity presents itself. And the proposal includes a phased approach, retaining as much existing retail as possible during construction. MOM's and CVS, for instance, could continue to operate if they choose on the northern portion of site while the southern portion is built. The plan fulfills the Arlandria Plan requirement for 10-15% open space: 10% of the property space would be reserved for public open space and another 5% would be for resident use. The building would be set back back 40 feet from Mt Vernon Avenue for pedestrian plaza space and will be pulled back 5 additional feet on Bruce Street to create better access to Four Mile Run Park and better vehicular access to stores and residences. The project would also fund up to $200,000 for new tennis/basketball courts, which would be relocated per the 4MR Park master plan. 7,000 square feet of the property along the park would be reserved for a pedestrian promenade with the potential for a future road should the City desire at some point. The development would also improve the quantity and quality of stormwater runoff from the site. The primary entrance to the residential portion of the parking garage would be through the center courtyard aligned across from Russell Road and the developer would rebuild that intersection and the southern entrance to the property for better automobile access than exists today. The development conforms to all of the standards set out in terms of bulk, set back and open space, but needs to be 7 additional feet taller in the center of the building to achieve the scale need to accommodate 28 units of affordable housing throughout the property. This housing which would be open to holders of housing vouchers and others who make less than 60% of Area Median Income. The residential portion of the property would be built to LEED green building standards, and the commercial portion would be build to LEED Silver standards. The project also includes $51,000+ in today's dollars (adjusted for inflation) annually for transportation management to keep single occupancy vehicle trips from the development to less than 40% of total trips. To help accomplish that, the developer would additionally install new bus shelters with real-time bus arrival data and would also install on-site bicycle amenities, including a Capital Bikeshare station. The developer would also provide a 20% employee transit subsidy. In the future, the development would be required to partner with other property owners to create a Transportation Management District to make further improvements to transit. The majority of road issues in our area are rush hour bottlenecks further on down the line, such as where West Glebe and South Glebe come together and where those roads hit Route 1. There is the need for targeted solutions for those bottleneck areas as well as better transit and bike options to allow people to switch modes away from single occupancy vehicle driving. Mt. Vernon Avenue in Arlandria is not a highway, nor even a high capacity road. 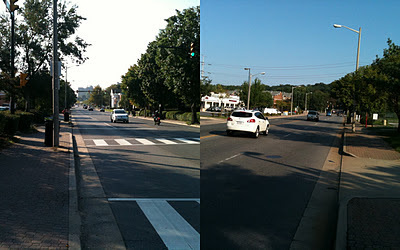 At its best, it could be an urban boulevard with wide sidewalks, easy pedestrian crossing places, and slow moving traffic. 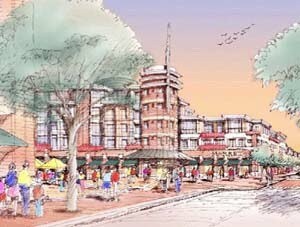 The Arlandria Plan vision of pedestrian-oriented, transit-oriented development is the antidote to the bottlenecks problems created by sprawl induced cut-through traffic. 9:15 on a Friday morning. 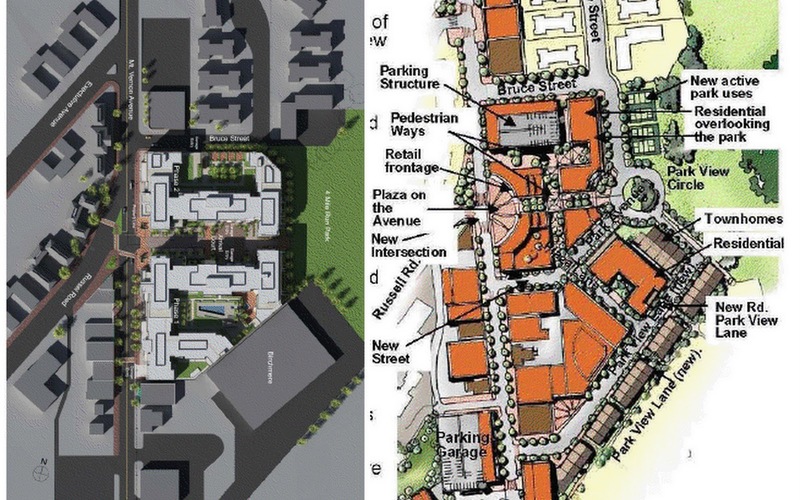 The small area plan is about making a pedestrian friendly community that brings current and future residents out on foot to enjoy the neighborhood. Right now, we are bathed in a sea of empty parking lots and people-second design. Bus routes connect the Avenue to points south and north, the Metro stations and the Pentagon. "Circulator" routes from a future Potomac Yard Metro and to the future transit line along Route 1 are in the works, but this will only work if complimented with sufficient density. In order to maintain our diversity, we have made a conscious decision that we would prefer to add the density of economic diversity that mitigates the negative impact of being the most impoverished community in the city. The development proposed by the Mt. Vernon Village Center helps us realize our long-awaited goal of becoming a safe, walkable, sustainable and inclusive community. We are proud of our multicultural environment, we have immigrants from around the world, but without the proposed development, the opportunity to fulfill Arlandria's potential will likely slip by and drive our neighborhood back to it's 'unfeasable' state. What we have learned through our journey is that every resident has a stake in making their own neighborhood the best it can be. All of us have a responsibility to step forward with an investment of the time it takes at least pay attention to the opportunities presented in their area. Whether it's the city or a developer considering making a change, make your voice heard. We feel strongly that this is the best opportunity to make Arlandria one of the City's greatest success stories. If you believe that too, now is the time to step forward, write a letter, show up, or even join in. Everyone's welcome - it's Arlandria! 940 parking spaces for 450 units seems crazy high.